Rita Lucey, Orlando, FL, married to Dan for 63 years, mother of four and grandmother of nine. She received her BA at Barry University, Miami and her Masters in Pastoral Studies from Loyola University, New Orleans. As a military wife, she volunteered with the Red Cross in military psychiatric hospitals stateside and overseas. 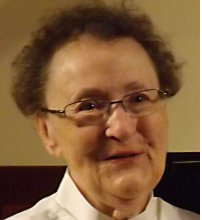 During that time she was a CCD catechist then a Religious Education Director and later volunteered with Hospice. In 1998 Rita spent six months in Federal Prison for protesting the training of Latin American troops at Ft. Benning, Ga. She was ordained a priest January 17, 2015 In Orlando, FL.